Email that’s always in sync. When you join MobileMe, you get a me.com email account that’s always up to date and in sync, no matter where you check it. MobileMe constantly looks for new messages, so you don’t have to. They’re pushed to your iPhone, iPad, and iPod touch automatically, and you’re notified as soon as they arrive. You’ll also notice that the inbox on your iPhone or iPad looks a lot like the inbox on your Mac or PC. That’s because it is. Read messages are marked as read, and all your folders are exactly the way you left them. Your inbox includes spam and virus protection. And you can access your MobileMe email from anywhere via a powerful, ad-free webmail app at me.com. Well hey, that sounds great! There’s just one problem with this. All of this “technology” has been available for anyone and everyone to use, for free. As far as the alternative goes for Mail, I suggest the use of Google Apps as it includes Gmail. In order to make use of Google Apps, you’ll need to have your own domain name, usually around $10 a year. If you don’t have your own domain name, you can still get a free @gmail.com email address. Once you set up your Gmail account, you can configure all of your mail clients to use IMAP to access your Gmail account. What’s that mean for you? It means all of your Email stays in sync, across all platforms, desktop and mobile. 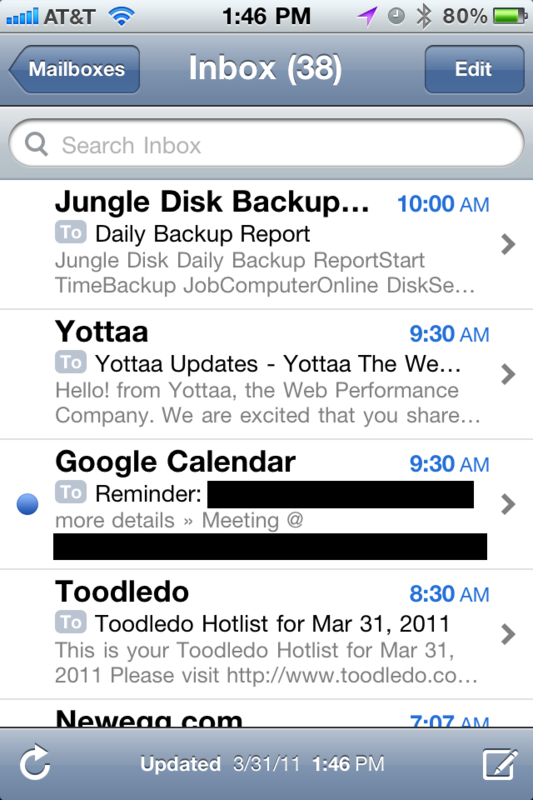 You can also configure Gmail to push all of your new email to your iPhone, iPad, or iPod touch, as soon as they arrive. And, of course, Gmail also offers spam and virus protection. 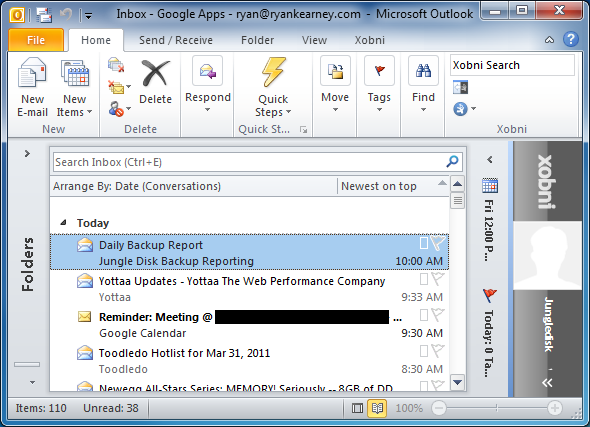 You would also see the same exact inbox if you viewed it from a Mac, BlackBerry, or Android device. Along with supporting every feature MobileMe has to offer, Gmail also provides a multitude of other features not supported by Apple. If you want to find out more about Gmail, you can check out their What’s New page. The only thing you don’t get with Gmail is an @me.com email address and the “add-free webmail app”. Gmail includes non-obstructive, text-based advertisements off to the far right of the screen next to the email body. These advertisements only show up in the web interface and even then, they only show up some of the time. Access contacts wherever you need them. With MobileMe Contacts, your entire address book is accessible from your computer, iPhone, iPad, and on the web at me.com. Say you meet someone and add that person to Contacts on your iPhone or iPad. MobileMe automatically sends the new contact to the cloud, and in seconds it appears in Address Book on your Mac or in Outlook on your PC. You don’t have to connect your iPhone or iPad to your computer or do anything at all. Your new friend’s information — phone number, email address, photos, and notes, such as “sat next to me at the parenting seminar” — is exactly where it should be, anytime you need it. Syncing your contacts is just as easy as syncing your mail with Gmail. First you have your web interface that’s accessible from anywhere you have a web browser and internet access. After that, you can setup an exchange account on your iPhone/iPad/iPod touch using m.google.com and your Google username and password. 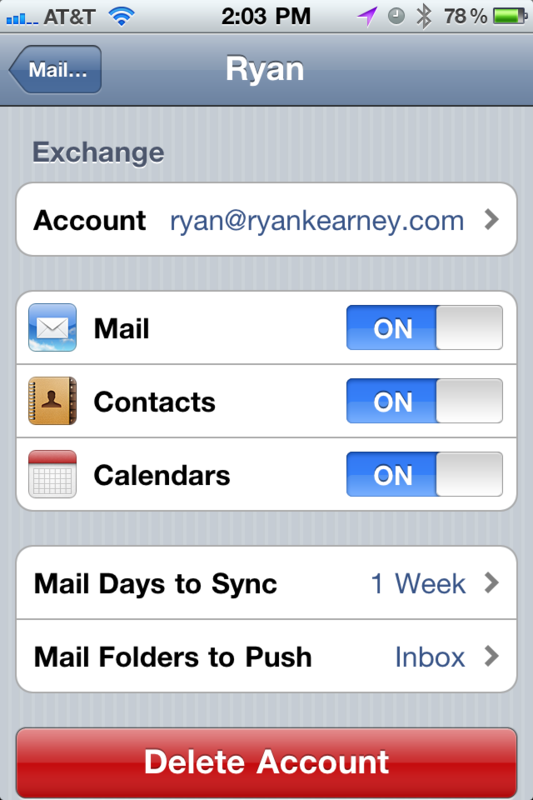 After that you can natively sync your Mail, Contacts, and Calendar with your iOS device. Now we’re left with syncing between Google and your desktop. Unfortunately, this is where Google falls short. While they do offer Contact syncing with Outlook, it requires a paid Google Apps account at $50/user/year. You can see the Google Apps Sync page for more information. If you go this method, you’ll be spending $60 a year which, while not free, is still 40% cheaper than MobileMe. Keep in mind, however, that there are free third-party applications you can use to keep Outlook and Google Contacts in-sync. Mac users can read this blog post from Google or check the official documentation regarding syncing their contacts with their Mac. Manage your schedule, not your devices. MobileMe keeps your calendar in sync across your iPhone, iPad, Mac, and PC, and on the web at me.com, so you always know where you need to be and when you need to be there. Change the time for your doctor’s appointment on your computer at work, and it updates on your iPhone or iPad — no docking required. Add an event on your iPhone or iPad and it automatically appears in the Calendar application on me.com. You can even share calendars with friends and family who are MobileMe members. As soon as someone adds or edits an event, it syncs over the air across everyone’s devices. So you’ll never miss a lunch date, soccer game, or important meeting again. Since this is becoming slightly repetitive now I’ll try to keep this one short. Anything Apple can do, Google does better. Above you can see Calendars easily sync with iOS devices. When it comes to desktop devices, you can check out Google’s Calendar Sync to sync your calendars between Outlook and Google. Mac users can find out how to sync with iCal by reading Google’s documentation. This is available for free to owners of new iOS devices so it isn’t exclusive to the MobileMe $99/year service. Apple has their Gallery, Google has Picasa. Take a look, check it out. Apple offers 20GB of space to store whatever files you want. Dropbox offers even more features, however their free account only offers 2GB of space. You can get more space, for free, if you refer other people to the Dropbox service. SugarSync offers 5GB account for free, although I prefer Dropbox to SugarSync. In addition to storing files, SugarSync and Dropbox have a much higher feature set than iDisk. While MobileMe may be just what the average user wants, there is always the risk of losing all of your data. Much like someone who has become attached to their @comcast.net email address or @att.net email address, you may not have it forever. For instance, let’s say you move to another state. You currently have Comcast but the area you’re moving to has Verizon FiOS. Since you’ll no longer be needing Comcast’s services, your email address goes with it. I could be wrong, Comcast may let you keep your address, but I think it’s the former. With Gmail, you always have your @gmail.com email address and there’s never anything to pay. Apple tries to make their services seem very simple to use and beneficial to the customer. While they are, customers also need to realize that there are a multitude of free alternatives out there of equal or greater quality. Published by Ryan Kearney 31 Mar, 2011 in Technology using 1350 words.